Today, I will compare two pairs of earbuds. The first one is Jaybird X3, highly anticipated headphones, which are replacing the former model – Jaybird X2. 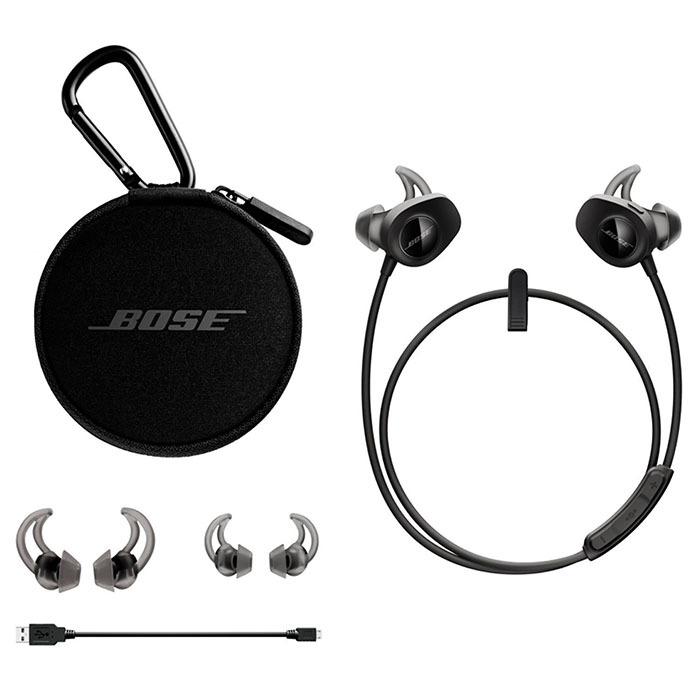 The second pair is Bose Soundsport wireless, the “open” design headphones. Both models are geared towards sports and fitness activities. Check this review to find out which model is better for you. If you are familiar with X2, you will find some similarities. One of them is a cable management clip to take up some slack in the wire around the back of your neck. The shirt clip is definitely strong enough to hold the cord in place behind your neck, You could remove one or both buds and let them hang, the shirt clip will keep them in place. The X3 headphones are smaller in size than the previous model and the shape of the earbuds make them fit in an ear much better. Although X2 is not bulky by any mean, X3 look much more fashionable to wear. The cheap plastic was replaced by a plastic that resembles aluminum. The logo has also this metallic look that feels more premium than X2. They are designed not to leak sound and block out everything that comes from the outside world. It’s like plugging your ears with your fingers. Just be sure that you won’t lose track of what’s going on, especially if you use them in high traffic areas. The Bose Soundsport may not be as sleek as Jaybird X3, but it’s compensated by the genius out-of-ear design. You won’t experience any pain even after several hours of use. Because they are quite big, I feel like they might fall out, but Stayhear+ design seems to keep them properly inside my ears. The earbuds rubber is flexible and soft, and molds to an ear canal easily. They come with three different sized rubber ear pieces that fit into the fold of an ear. The shirt clip is quite versatile and can also be used to attach the cord to a baseball cap. 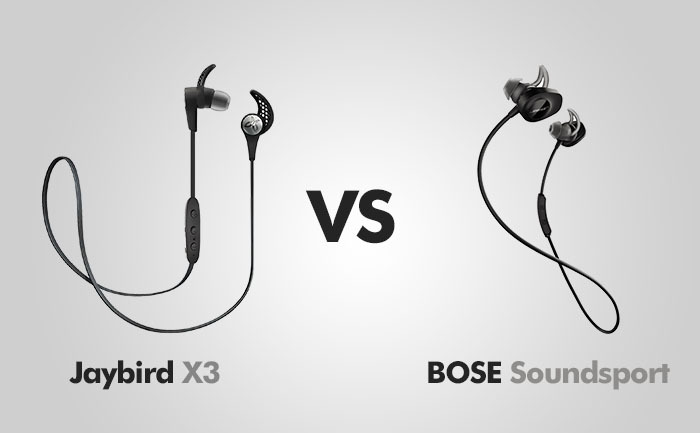 If you like your earbuds to fit nicely inside your ear canal and isolate a lot of sounds, go with Jaybird X3, if you want your earbuds to sit on the outside of your ear canal – choose Bose, they will let more sound to compensate the noise they are letting in. Both models are designed to be sweat-proof, making them perfect for a gym and fitness. 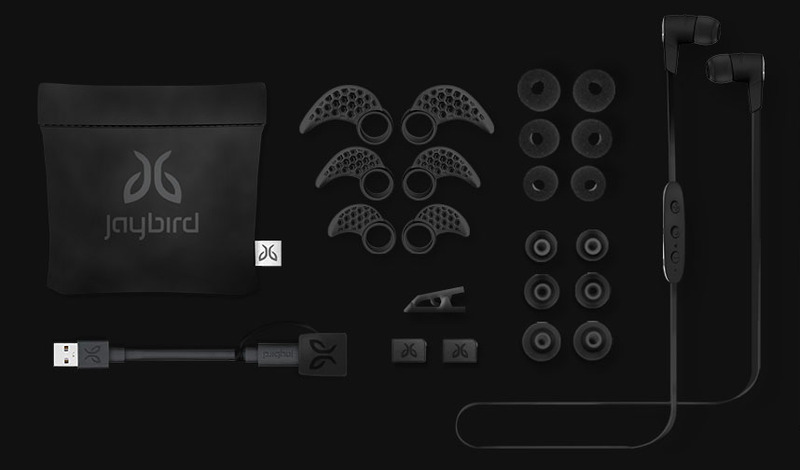 When you try Jaybird out of the box they may lack bass, and sound flat. You can change it by using a dedicated app called MySound, available on Android and IOS. With this program, you can adjust the sound according to your needs. If you listen to classical music you can change settings to have crispier highs. If you are EMD or hip-hop fan just add punchier bass. Also, remember to choose the pads that fit nicely in your ears. If you use improper pad size, your earbuds will fall out and the outside sound won’t be isolated. Similarly to Jaybird, you can download a dedicated musical app for Android and IOS to tweak some minor functions, but it doesn’t give you that much customization as the Jaybird MySound app. As I mentioned earlier, Jaybird earbuds have a nicer fit and isolate a lot more sound than Bose. They are more suitable for noisier environments, with the exception of running and cycling, because you need to be aware of the traffic. I would choose Bose when I am not active. The loose fit makes them much better for long listening sessions. Comfort level is great, even after a few hours of listening. The sound is better than any other earbuds, especially when it comes to bass. With Jaybird, you have to tweak them with the MySound app, where Soundsport sounds great out of the box, even at high volume levels. Some people complain about X3 proprietary charger design, especially when there is a micro USB charging in X2. It may seem like an unnecessary step, but there is also an advantage of such decision. Most Bluetooth earbuds have a micro-USB input to charge them. The problem with this approach is that these headphones are created to endure difficult conditions, such as sweat or dirt. If this gets into the socket you may not be able to charge the headphones anymore. And with a broken battery the headphones are useless. The Jaybird X3 has small connection points that are not too deep, so if you get dirt in the connection points, it’s easy to wipe it out. When it comes to battery, with the Bose you will give you at least 6 hours. And it’s definitely 6 hours. You won’t go under this number. With the Jaybird is about 8 hours, but sometimes you can get less, like 7, which is still better than Bose. PROS: Good sound / Great battery / Upgraded control buttons / Can take phone calls / Sweat-proof / MySound app / Good sound isolation / light. PROS: Great sound / Premium feel / Good bass / Bluetooth range / Can take phone calls / sweat-proof / Comfortable. CONS: Bluetooth range. CONS: Big / Small battery.